Are Migrants Handing the World Cup to France? Whose World Cup Victory Is It Anyway, Africa or France? Kylian Mbappe celebrating scoring a goal for France in a pre-World Cup match in March 2018. Cape Town — He has been compared to Brazilian legend Pele for being the first teenager since a 17-year-old Pele to score twice in a World Cup game. And as if his stunning double in France's World Cup win over Argentina was not impressive enough, the past few days in Paris have continued to add to the absurd resumé Mbappe has compiled. Now the teenager has again written his name in football history after becoming the first-ever winner of the Kopa Trophy for the Young Player Of The Year at the Ballon d'Or ceremony in Paris. It was only two-and-a-half years ago that the teenager made his professional debut, but the rise of Mbappe - the second-most expensive player in history - has been spectacular . 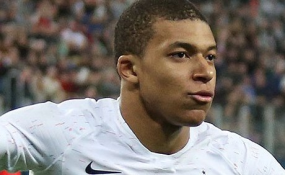 Mbappe, who lifted the World Cup in France as well as storming to yet another Ligue 1 title with PSG, beat off competition from the likes of Liverpool's Trent Alexander-Arnold, Borussia Dortmund's Christian Pulisic and Roma's Justin Kluivert to be named the victor. The new award, named after French former Ballon d'Or winner Raymond Kopa, was voted for by 33 former winners of the main Ballon d'Or prize. Mbappé came into prominence at an early age, starring for the youth academy at Bondy before gaining a move to Monaco, where he made his professional debut in 2015, aged 16. He then quickly established himself as a regular goalscorer for the first team in the 2016-17 season, as he helped the club gain their first Ligue 1 title in seventeen years. A year later, he transferred to Paris Saint-Germain for €180 million, making him the most expensive teenager, and the world's second-most expensive player. Born in Paris, France, his father, Wilfried Mbappé, is from Cameroon, while his mother, Fayza Lamari, is of Algerian origin. He was accompanied at the ceremony by his father and his younger brother Ethan.